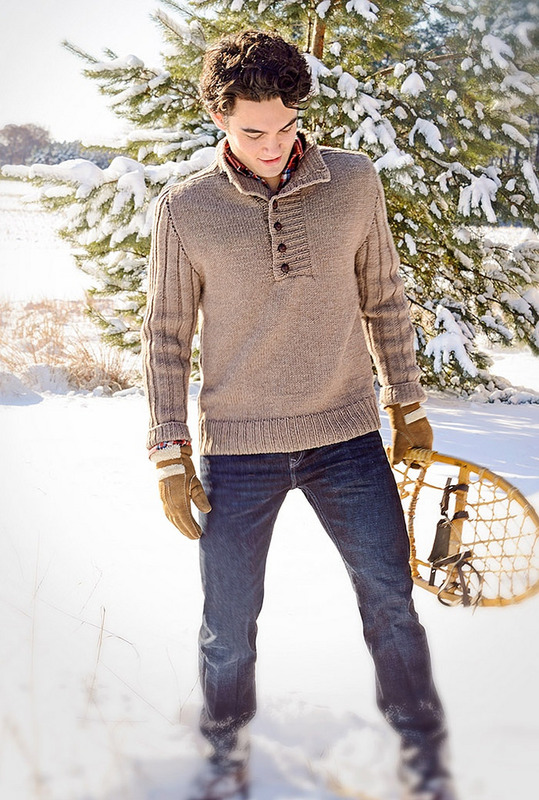 It’s been several months since we peeked into the latest men’s knitwear designs. Let’s go exploring…. Today we’re all about color. PINCH ME but that is luscious. 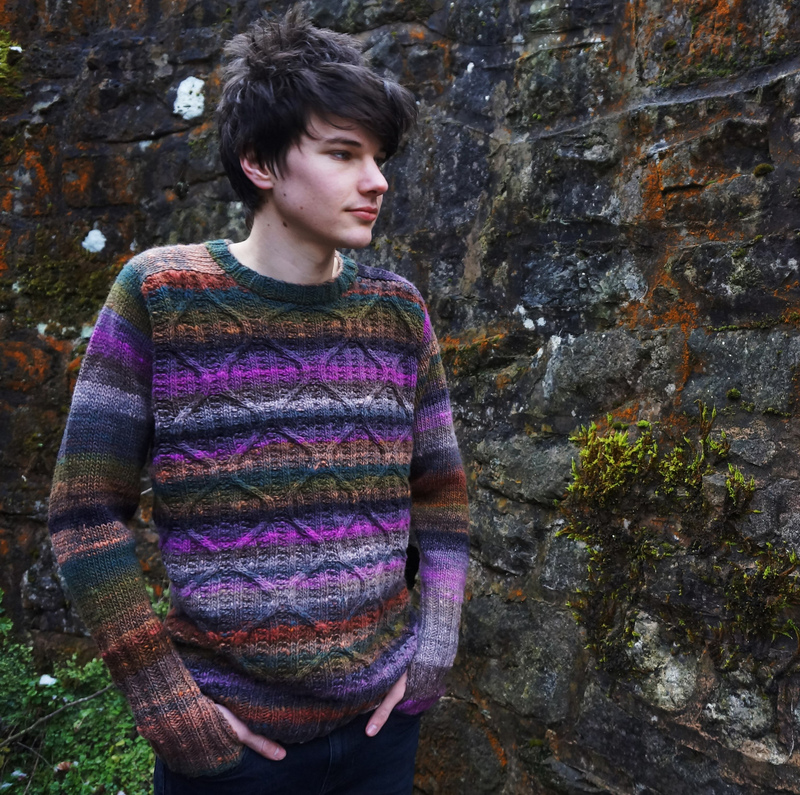 This is Wester Ross by Welsh designer Jane Howorth and knit, of course, out of Noro Kureyon. 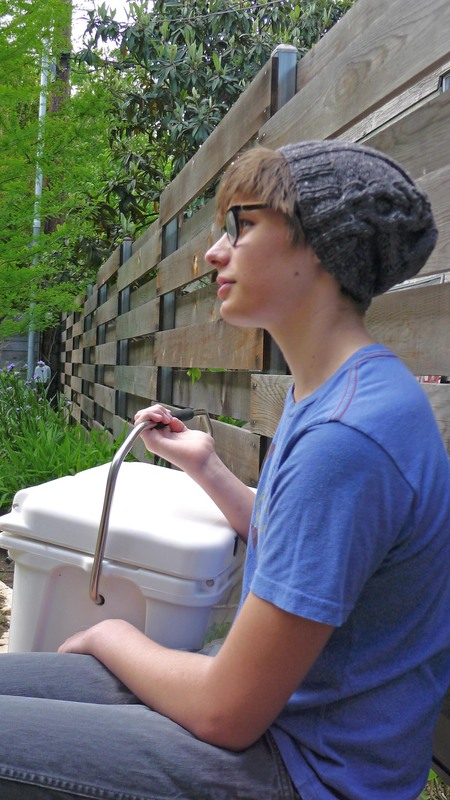 Pictured here on a teenager, the sizing ranges from 34.5–53.5 inch chest. I absolutely love the way the cabling and knit-and-purl texture plays with the striping effect of the yarn, the way the saddle shoulder cleverly travels across the top back (see below), the extra-long ribbing and thumb holes at the cuffs, and the impeccable shaping (no slouchiness!). Jane has designed some other gorgeous men’s sweaters that you should also take a gander at; I will definitely be keeping an eye on her from now on. Bristol Ivy’s Quoin cowl is worked in three colors of worsted-weight wool—potentially yarn you already have in your stash. I love how she has combined asymmetrical striping and deep chevrons into a simple-to-knit but bold design. 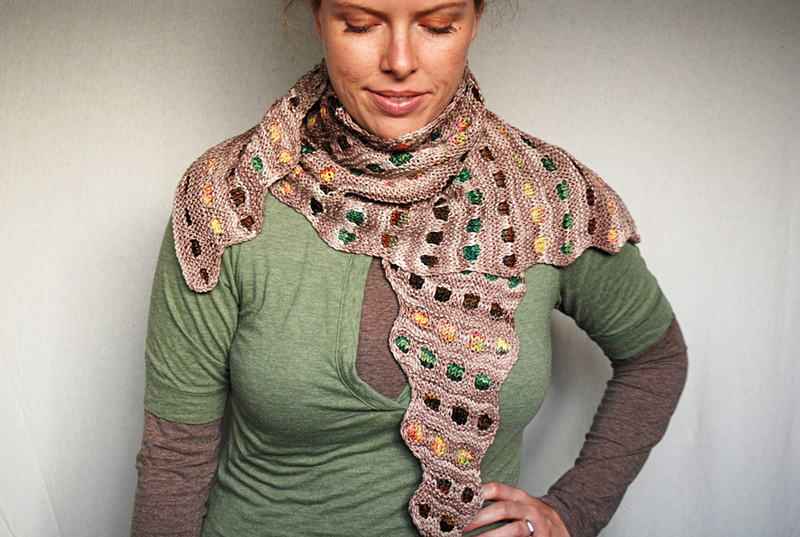 It’s like a Color Affection Shawl for your neck … with a lot less knitting. Looking for a more ambitious knit to occupy the long summer days? 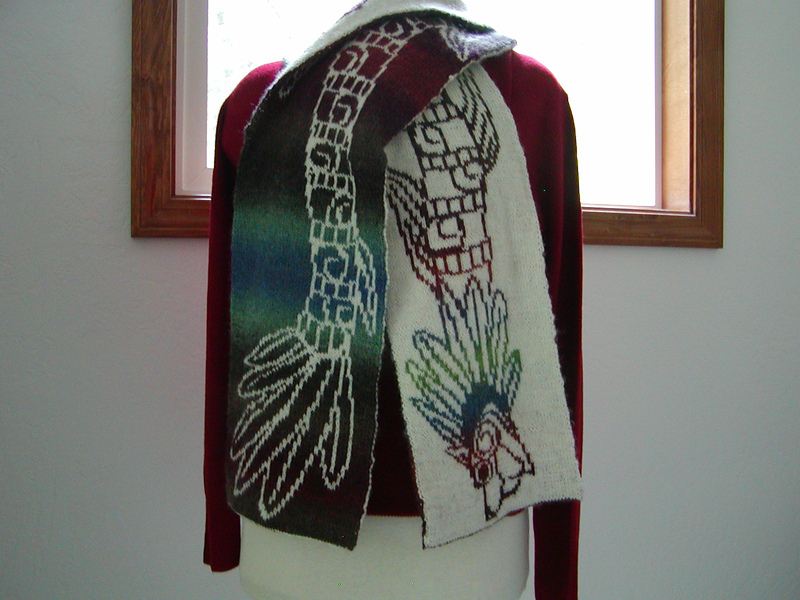 I love this Mayan Ouroboros scarf pattern from Tania Richter. The instructions can be purchased individually or as part of an eight-pattern e-book called Fantasy Art Knits—all double-knit scarves with fantasy creatures fabulously charted out (in both senses of the word fabulous!). Five patterns have been released so far, including a Nine-Tailed Kitsune that is screaming my name. Many of you in the northern US are blanketed under snow right now, so it’s a good moment to check in on the world of men’s knits. As it happens, most of my favorite recent patterns for men are for your neck, so let’s warm up that throat! 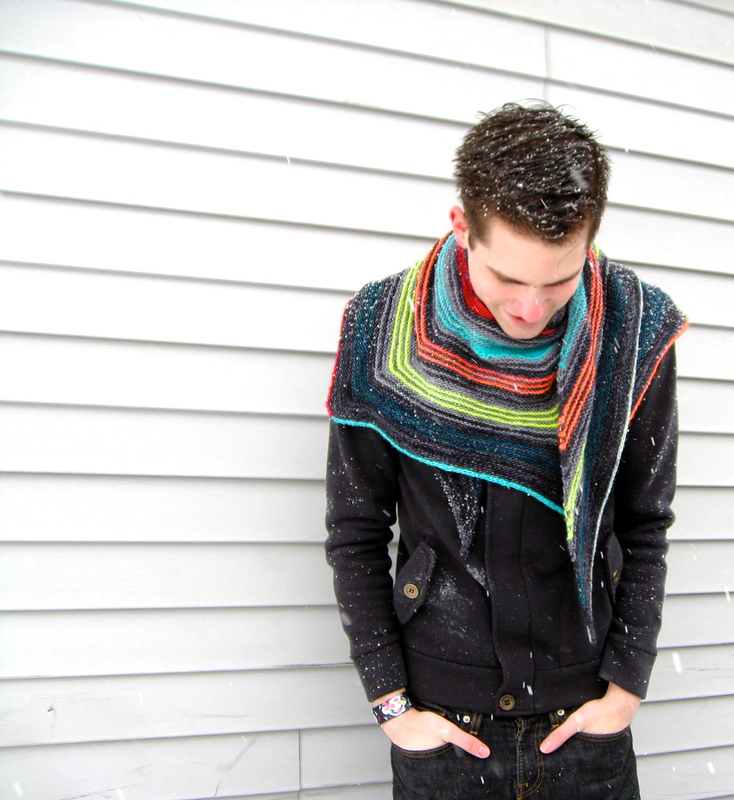 First up is another fantastic shawl pattern by Josh Ryks, called Tailspin. Originally knit with Madelinetosh Tosh Merino Light, this would make a great project for sock yarn scraps, as you only need one full skein of one of the colors. The remaining colors only require anywhere from 50–200 yards each. 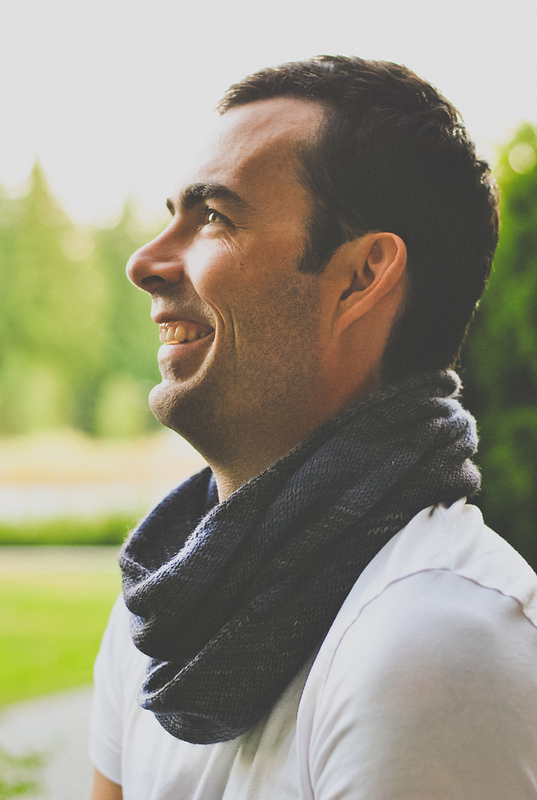 If you are as charmed by Josh’s style as I am, you should also check out his video podcast, Sword of a Knitter. 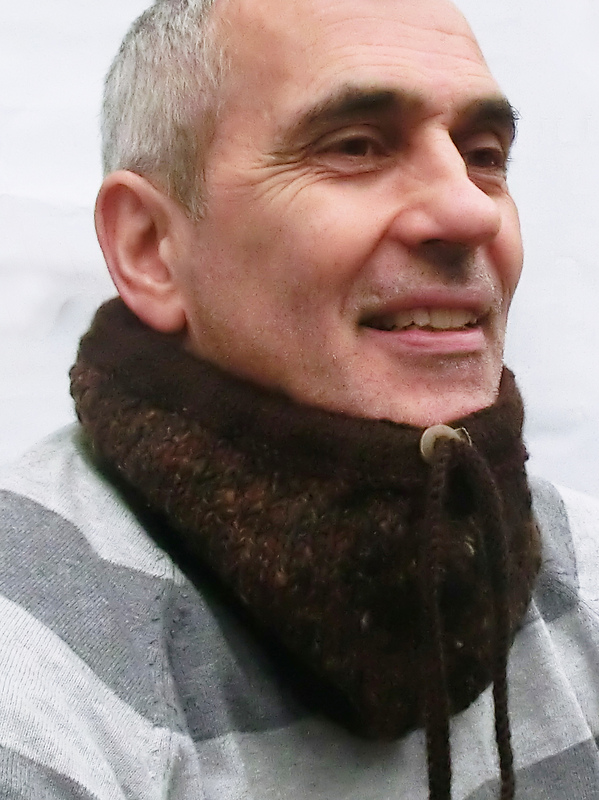 Speaking of keeping your neck warm, here is an unusual but very wearable style for your next men’s cowl. This is the Neckwarmer Cowl with Toggle by the prolific British designer Ruth Maddock. The toggle can be tightened to snug the cowl up around your neck for extra warmth. The original uses an Aran and DK yarn held together, but you could also substitute a bulky yarn. 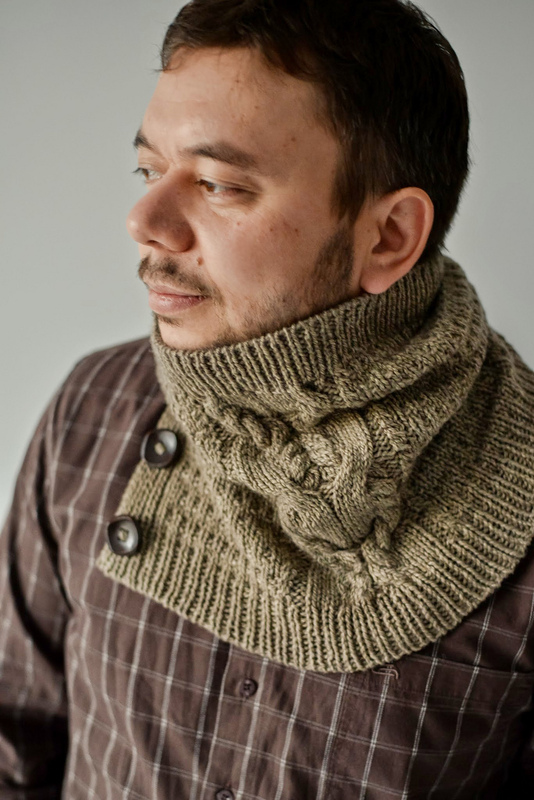 If you’ve got some handsome buttons burning a whole in your craft drawer, check out the luscious Garfunkel cowl by Polish designer Justyna Lorkowska. This piece requires about 250 yards of a worsted-weight wool. It buttons just at the bottom so that you can wear it either buttoned and scrunched around your neck, or open and spread out to protect any part of your chest not covered by your coat. Very stylish. 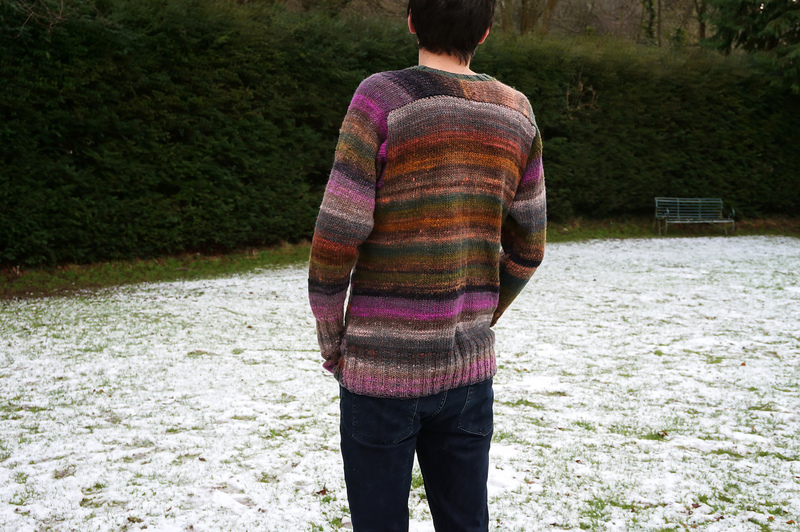 I’ve published a new pattern for men as well! 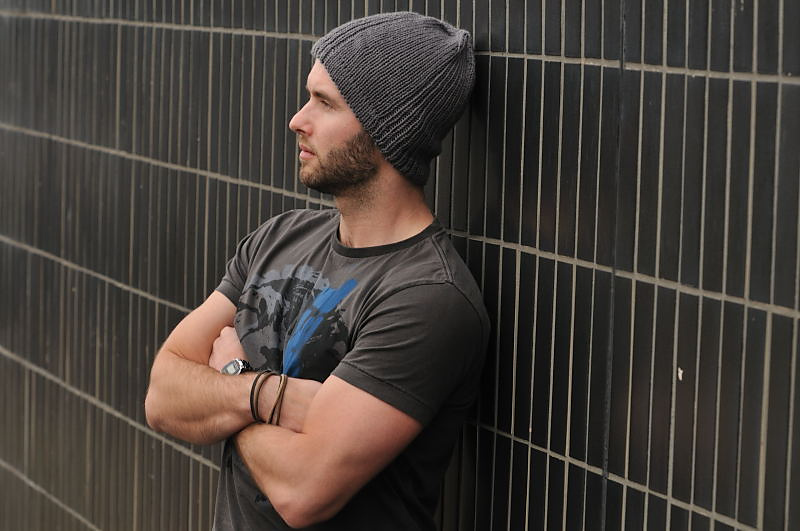 My husband (pictured below) has a very handsome, but often chilly, shaved head, so when Bijou Basin Ranch sent me a skein of their delicious Lhasa Wilderness yarn, I knew just who was getting a hat. Lhasa Wilderness blends yak down and bamboo, giving the fiber an incredible softness and luster that are perfect next to the skin. 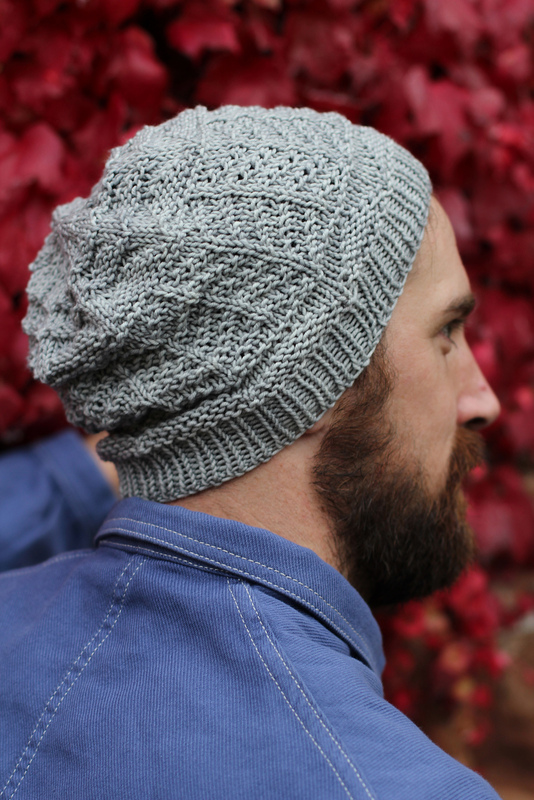 My Aftershave Hat pattern uses a simple textured pattern to show off the drape and luster in the yarn. You’ll need 160–180 yards of a sportweight (depending on which size you make), and any drapey luxury fiber such as alpaca or cashmere would make a fine substitute. Do you ever have those times where you’ll cry if you have to knit any more stockinette or garter, but you just don’t have the mental bandwidth to handle cables or lace? 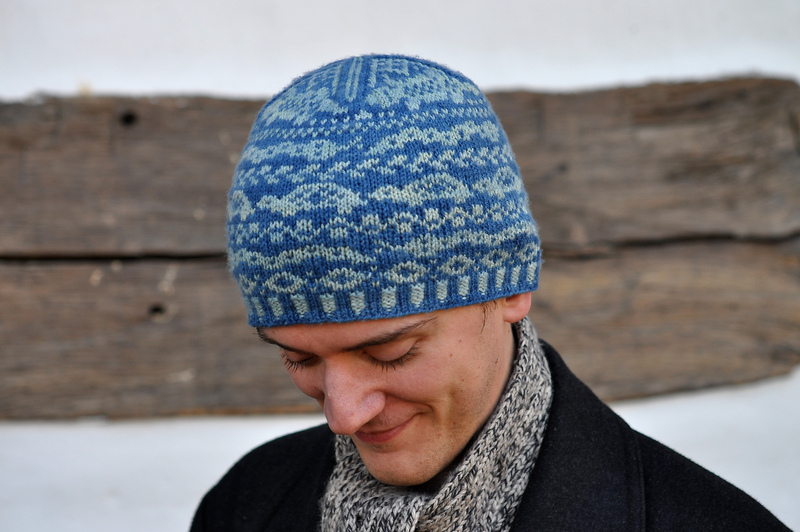 Helen Stewart’s Eden Fells Hat is the perfect pattern for such times. A slouchy beanie worked entirely in knits and purls, this hat will work up quickly in a worsted-weight yarn. But we are not talking about gift knitting, are we? NO, WE ARE NOT. How about something for the man with a sense of whimsy, that certain joie de vivre that gives him the confidence to go beyond the standard male uniform? For you, there’s the Reptilia Hat by Sara Burch. There’s a charming subtlety to this, the way you can’t see the animals—snakes, tortoises, and crocodiles—until you look more closely. Aw, heck, let’s just go all full whimsy and admire the sheer fun of Sunshine Stewart’s Masked Superhero and Burglar Hats, which are sized from baby to adult for MAXIMUM DAD-KID ADVENTURE TIME. And finally—because I’m going to keep saying it until more of you guys start wearing them—damn, I love a man in a shawl. This lovely piece is the Entre Deux Shawl by Camille Coizy. It’s knit in several colors of Aran weight yarn, so very cozy, no pun intended on the designer’s name. And yes, I see that she is French. Yes, I know that American men are less adventuresome in their clothing tastes. But COME ON, that guy looks amazing. Think it over. 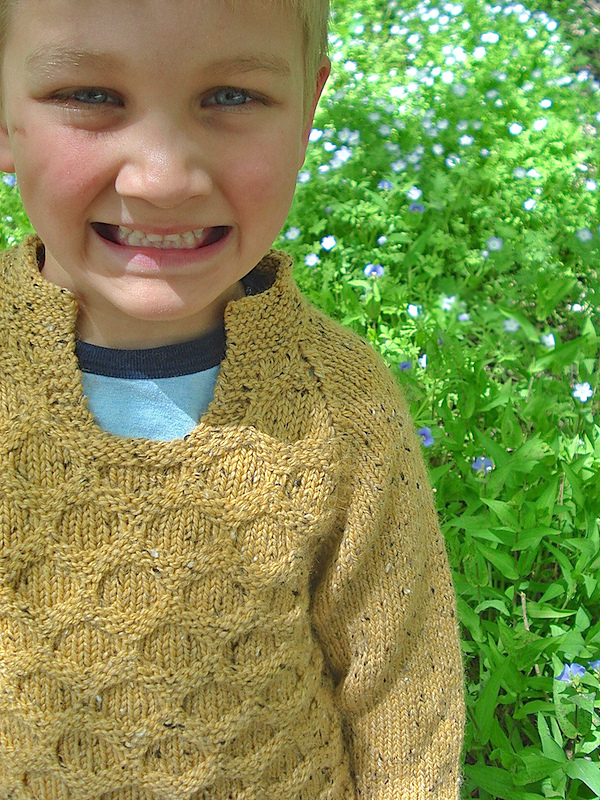 This post originally appeared on the Dark Matter Knits blog (darkmatterknits.com), © 2014 Elizabeth Green Musselman. 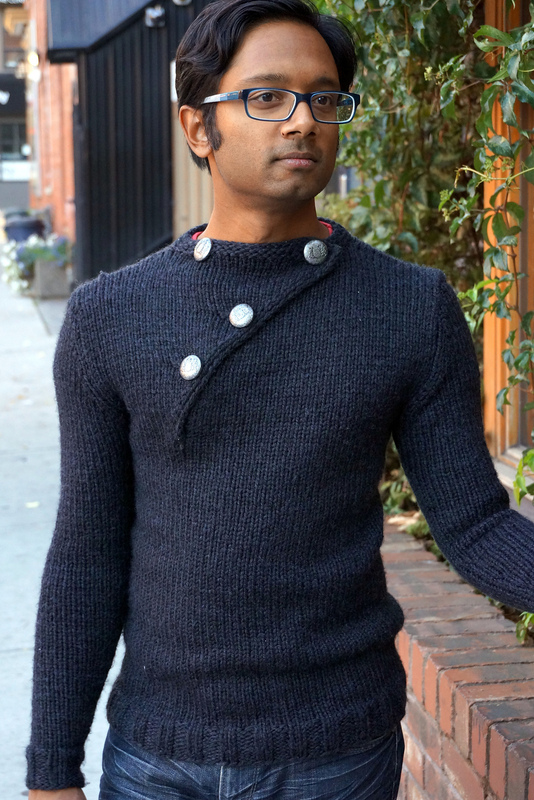 With the Indie Design Gift-A-Long (GAL) starting on Ravelry tonight (at 8pm EST), I thought I’d show you some of my favorites of the men’s and boys’ patterns that are eligible for the GAL’s generous 25% discount. There are 293 designers participating in the GAL, each person putting between 4 and 20 patterns on sale, so wading through everything can take a while. There is, of course, a great pleasure to be had in this browsing—a pleasure I’ve been indulging in last night and this morning—but if you’re looking specifically for men’s and boys’ knits, the search could get a little tedious. Never fear! I’ve pulled together a substantial catalog of my favorites from the men’s and boys’ patterns that are part of this year’s GAL. This is by no means a complete list of what’s available in the GAL for men and boys—these are just some of my faves. 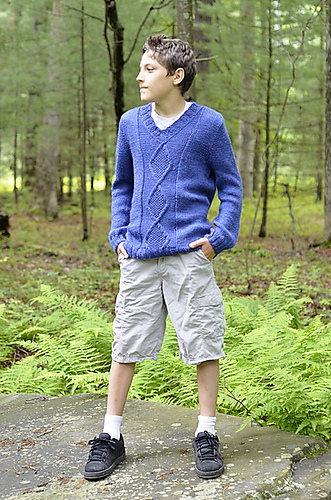 Also bear in mind that some of these designers have multiple patterns up for boys and men, so if you see something you like, click on the designer’s name on the Ravelry pattern page, and see what else they’ve got in their Gift-A-Long bundle! Such a great neckline. Perfect for men who are either slim or very muscular. It is entirely possible that I am being influenced by what is—erm—not the hat in this photo. Modern look and a great way to make a neutral yarn fun to knit. 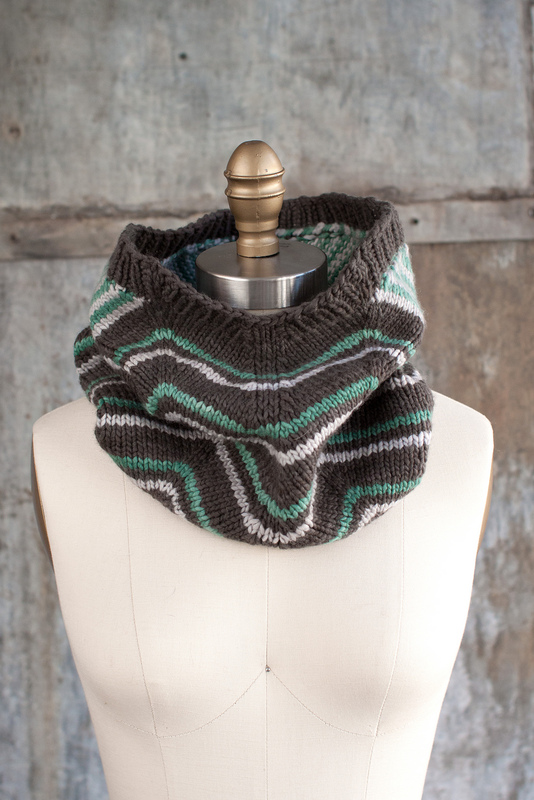 Shawl collars are perfect for the cold, and the texture keeps the knitting interesting. Rich has tons of great men’s socks available in the GAL. 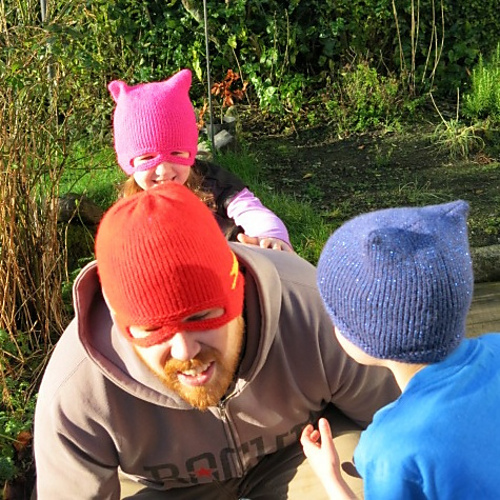 I’ve included two photos here to show you how cool this reversible, double-knit hat is. 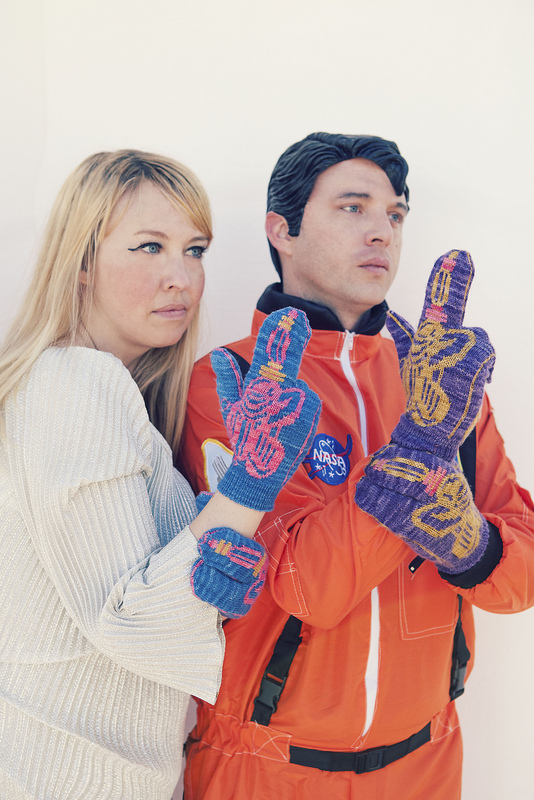 For the sci-fi fan, it doesn’t get any cooler than these gloves. 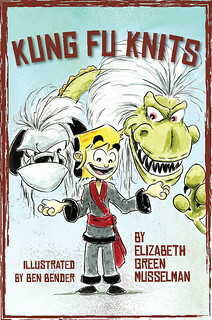 Curse your sudden but inevitable betrayal! Excellent use of texture—and three cheers for the non-standard issue model. For the man who loves color, this scarf is where it’s at. Anneh’s socks are modeled by women, but most are perfect for men and all have interesting construction. There are a number of great designs for baby and toddler boys in the GAL, but here I’m focusing on boys aged 4–18. 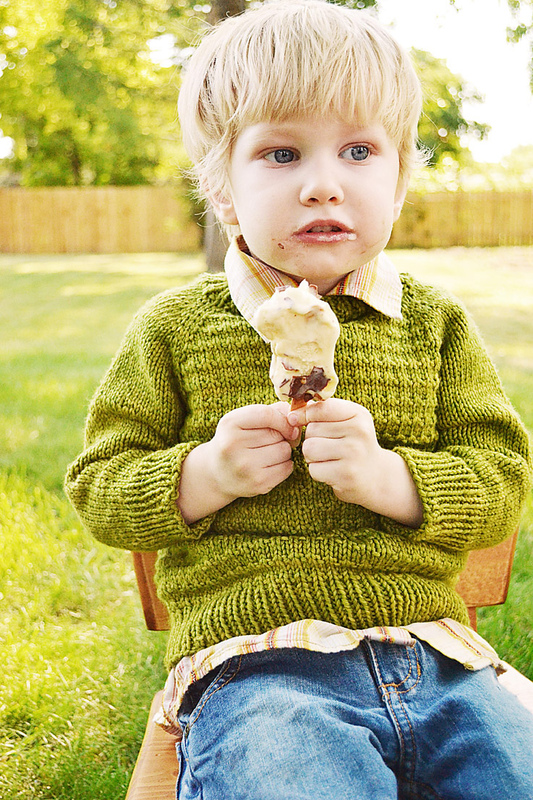 Great classic knit, in both sweater and vest version, sized 3mos to 12 years. 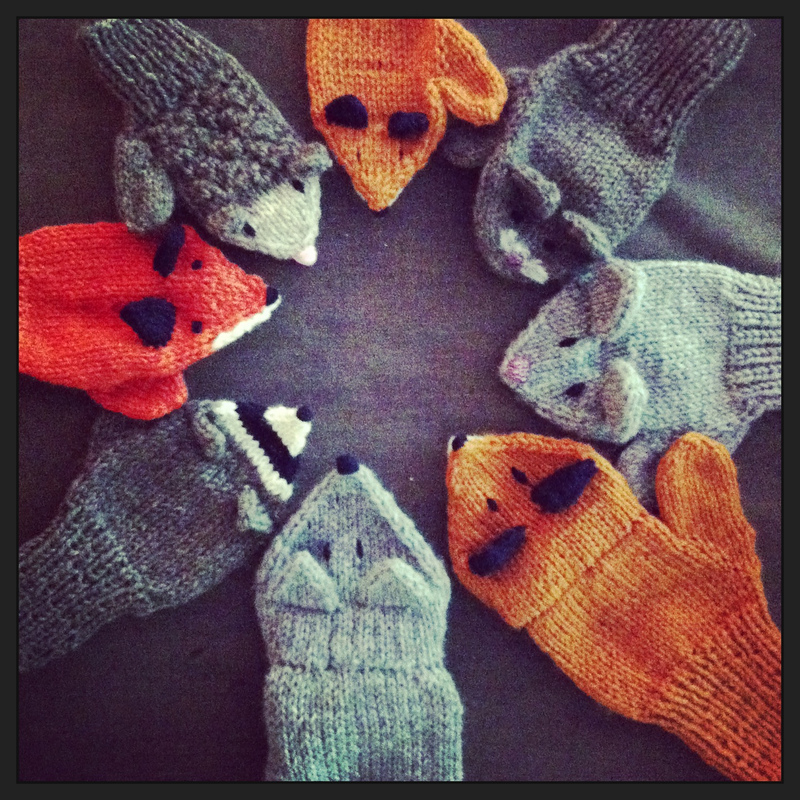 Birch Hollow has a whole range of woodland creature mittens in the GAL. This adorable, quick, bulky knit comes in sizes 6mos to 12 years. Will wonders never cease? 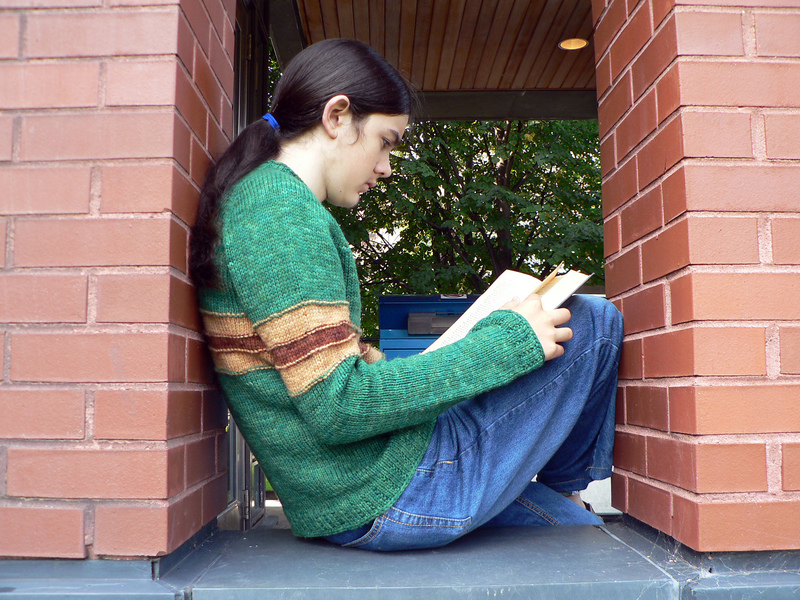 A sweater pattern written just for teen boys! Who doesn’t love pockets? Just enough texture, too. Sized for toddlers to tweens. 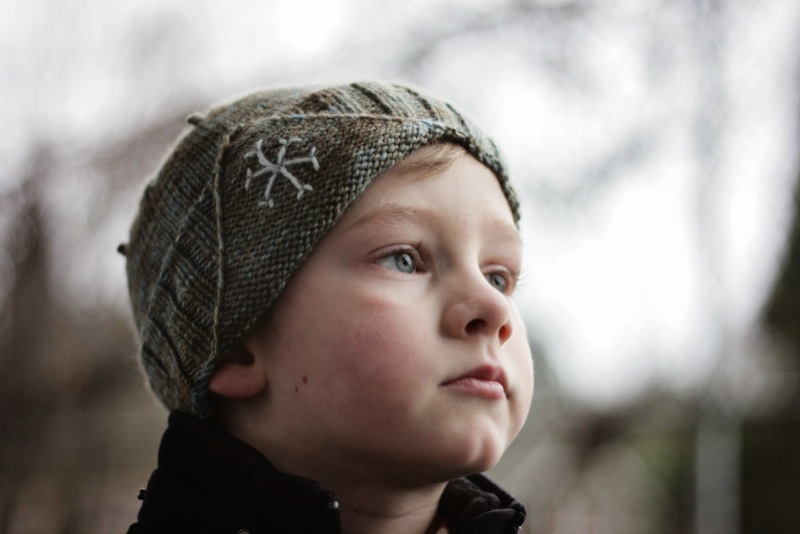 This hat is sized for children and adults, but looks especially dashing on this little guy. One of my first designs and still one of my favorites—just knits, purls and slip stitches. 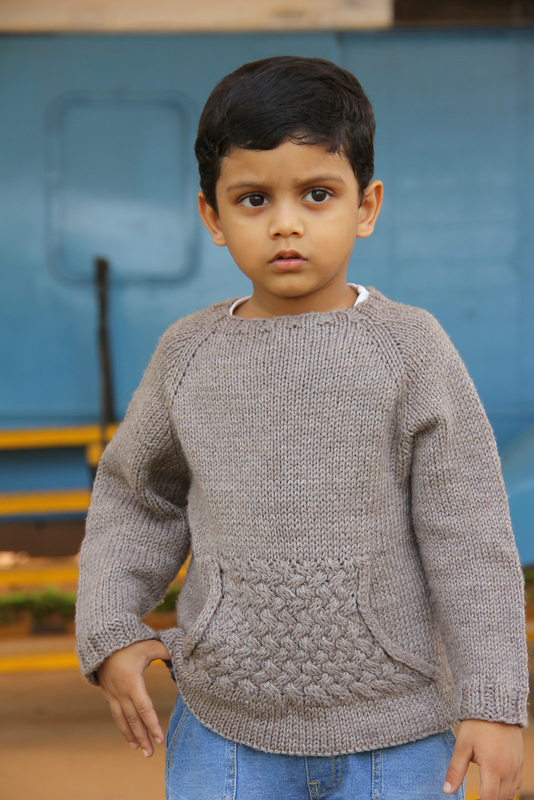 Another classic use of texture and raglan shaping, sized 12 mos to 8 years. Have fun! And don’t forget to join the knitalongs that go along with the GAL. 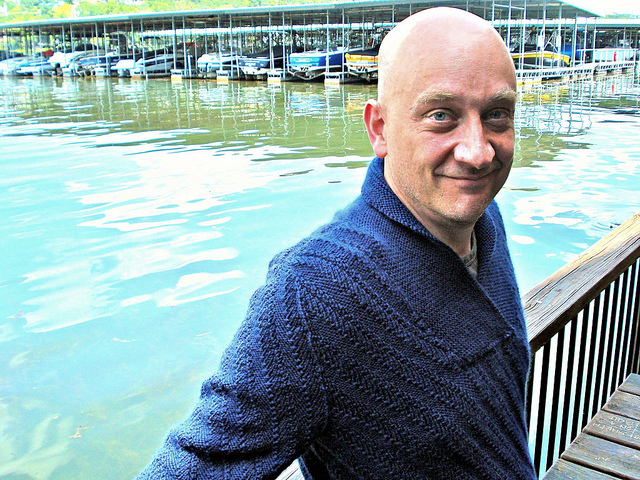 Time for our monthly check-in with what’s new in men’s knitting patterns! 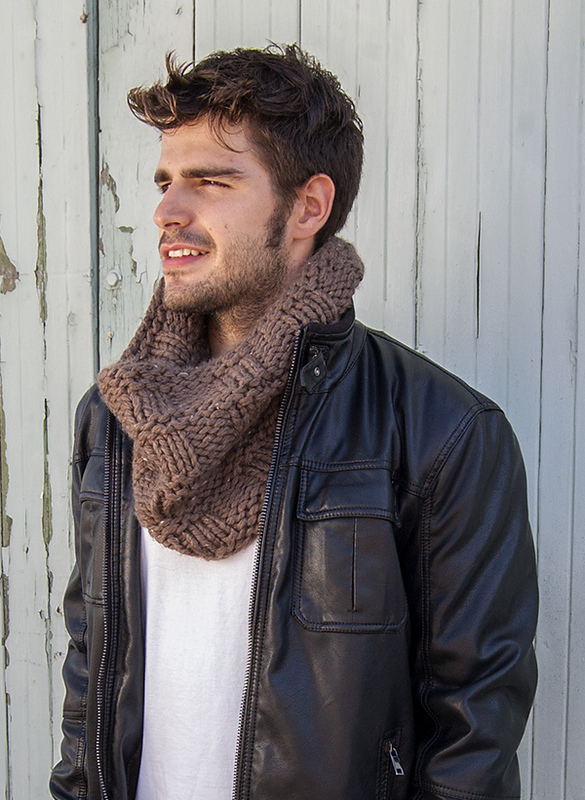 You know what makes you want to knit a man a cowl? This guy. Before he put on this super-bulky alpaca cowl, he wasn’t much to look at. But pop on that great-looking neck accessory and a leather coat, and BAM! 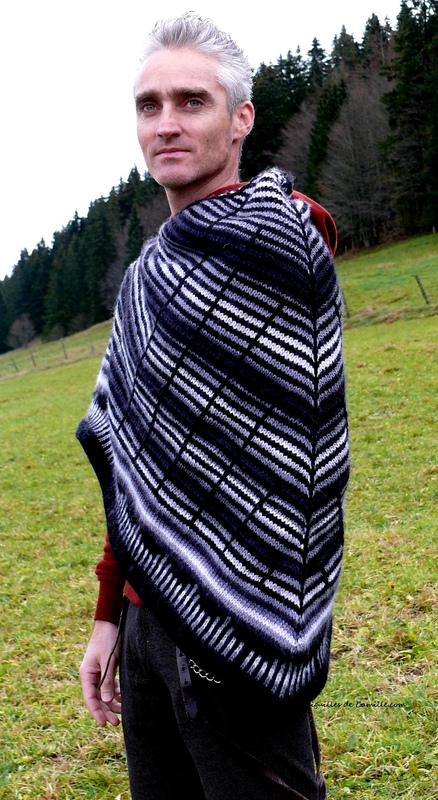 This simple-but-effective pattern by Los Angeles LYS Knitculture (hilariously called Man Cowl) is free on Ravelry. 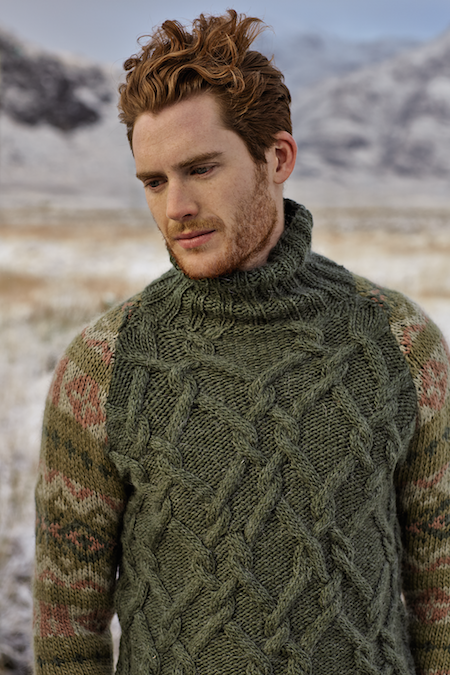 All ye Outlander fans really need to check out Rowan magazine issue 56, which features absolutely stunning Scots-inspired colorwork and cabling, including six sweater patterns for men. My personal favorite is Craggie by Marie Wallin (shown above). That mashup of stranded knitting and cables is luscious. 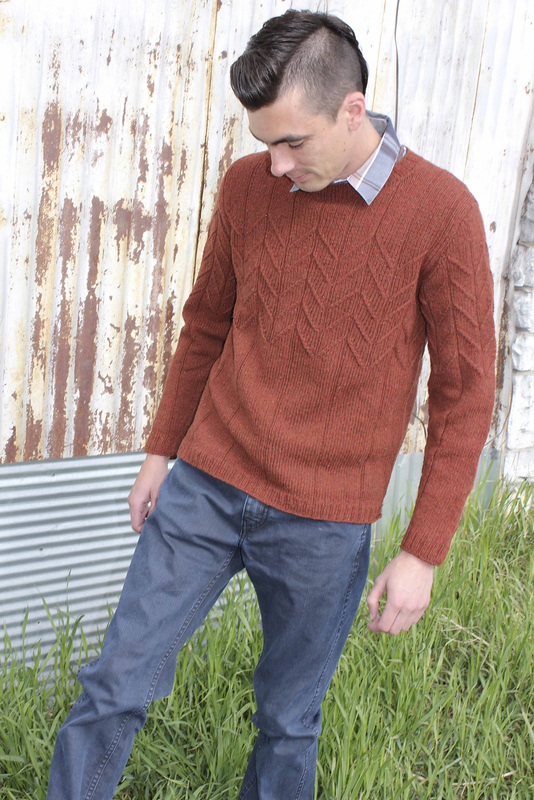 For another exciting update on the classic men’s cabled sweater, check out Shannon Mullett-Bowlsby’s Men’s Cabled Knit Sweater. There are a lot of thoughtful details in the construction of this garment—such as instructions for a longer torso and a wider turtleneck—that will ensure a flattering and comfortable fit. If you enjoy knitting socks, definitely check out the new book Sock Architecture by Lara Neel of Math4Knitters. The book has tons of great information about how to measure for and customize socks to fit any foot—and most of the patterns in the second half of the book would work just as well for men and women, both in terms of sizing and looks. 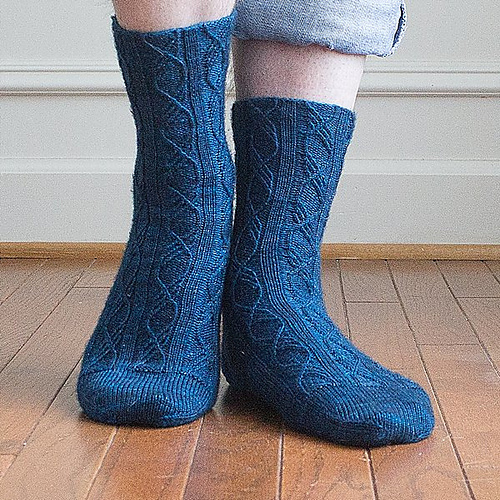 I’ve already knit the Strie, Toe Up Socks for my husband, and I’ve got my eye on Bootstrap next (pictured above). It’s hotter than blazes here in central Texas, and it will be for a while. Still, we knitters have to knit into the future, don’t we? This year, I’d really like to be that knitter who has made the mittens before they’re needed. 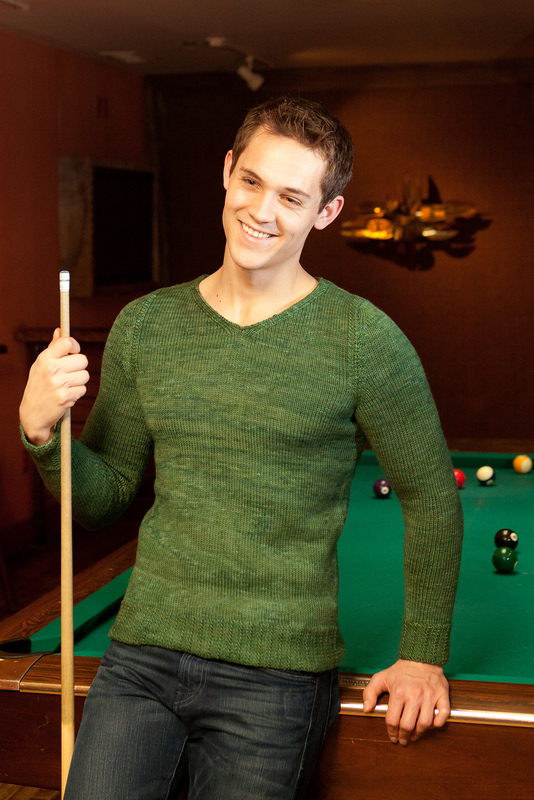 In that spirit, let’s take a look at some of the newer men’s sweater patterns for this fall…. Ann Budd is a master of the classic design, and her new Goat Herder Pullover showcases that talent perfectly. There’s just enough texture here to please the knitter, while still maintaining an unfussy look that will appeal to many men. This is originally worked in Brooklyn Tweed Shelter, but you could readily substitute a less costly worsted-weight wool if you wished. Plus: hello, adorable floppy mohawk. Good to see some variety in the modeling. Meow, that’s what. This is Ann Weaver’s James Dean Verdant Pullover, published in the recent collection Silver Screen Knits: Volume Two, edited by Kathleen Lawton-Trask. The book includes 11 other luscious designs—two more for men and nine for women—all inspired by classic film stars. The genius of Ann’s pullover is all in the details. The shaping is impeccable, with an emphasis on PEC. If you’re knitting for someone with a muscular chest—perhaps it’s yourself?—this will look fantastic. The fitted sleeves and not-too-deep V-neck also emphasize a muscular shape. Some nice twisted ribbing details at the cuff and hem elevate the design further. You’d want to take the wearer’s measurements carefully before knitting this, because fit is everything here. 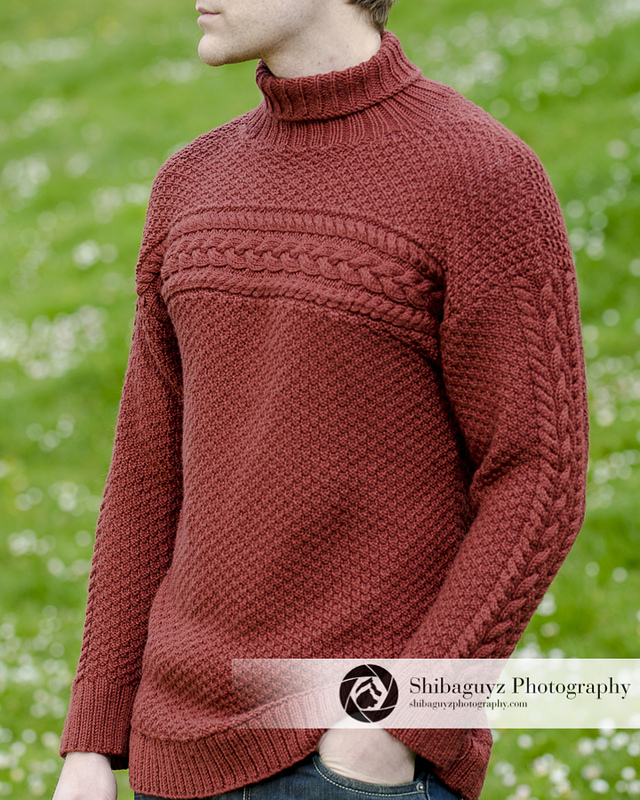 I have a new sweater pattern for men out as well! 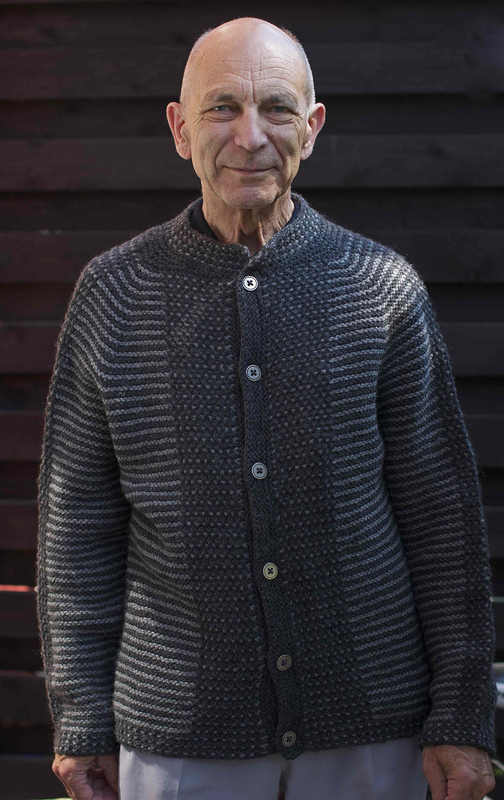 This one, called the Colonel Henley (Ravelry link), was commissioned by the lovely people at Spud & Chloe, and designed with Sweater, a cozy blend of wool and cotton that’s perfect both for transitional weather and for the warmer internal temperatures that men often have. I’m especially proud of the construction on this garment: it starts at the neck, building out the saddle shoulders and working down from there in one piece. The instructions include some waist shaping, and the overall effect is slimming. I was going for a kind of “updated retro” look. Finished chest sizes range from 35–55.5 inches. We’re often exhorted to “bind off loosely,” but sometimes that can be hard. Today, I talk about how knitting helped stay calm and loose through some alarming medical news; how I almost completely blew it while having a shawl that I designed test-knit; and how to work Jeny’s Surprisingly Stretchy Bind Off without it ruffling at the edges. Receive the Dark Matter Knits monthly email newsletter: exclusive coupon codes, news about patterns and the podcast, and more! Our group on Ravelry—come join us for the new “pass it on” project and other fun discussions about fiber crafts.